I know what you're thinking, "another Bluetooth speaker". Yes, there is a flood of them on the market. We've had our fair share pass through the BetaNews office and most are comparable and a few even stood out for one reason or another. 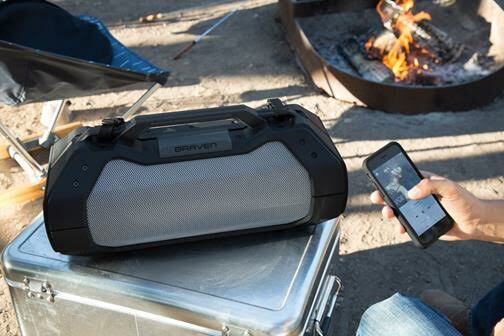 Now Braven is announcing its latest offering. It's a name that's no stranger to us, we've reviewed previous models. This one is a bit different though. This is an indoor-outdoor model that features a rugged design and a size a bit larger than you'd expect. It also features HD sound and a 15,600 mAh battery so you can charge your phone -- good for the beach or a tailgating party. The company even claims a 14 hour battery life, so you won't have to worry about making it through the day. "The BRV-XXL is a modern boom box that not only pumps the crowd up, but keeps the party going for hours", says Andy Fathollahi, chief executive. "This is the perfect speaker for anyone who enjoys life to the fullest. From tailgates to campsites this speaker is designed to impress, it even comes with a built-in bottle opener on the strap". This isn't a small device, it comes with a carry strap and tie downs to secure it wherever it's set up. It also features NFC technology; an on-board control to easily adjust bass, treble, volume, and skips tracks. It even boasts a "3.5 mm microphone input for impromptu toasts and announcements". None of this comes cheap, at least by Bluetooth speaker standards. It will set you back $349. It's available now online and Braven claims it will be in Best Buy later this month.